Some dogs love to romp and play in the winter weather, others prefer to snuggle indoors where it's warm. No matter which your dog prefers, they all will need to be protected from the elements when they do venture outside for a walk. 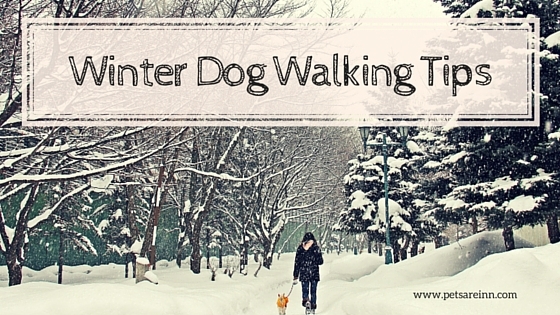 Read below for 5 tips to keep your dog safe on walks during the winter! Yes, some dog breeds are built to venture out into the cold without extra protection (Huskies, Saint Bernards, etc), most dogs would be safer (and more comfortable!) with a nice coat or sweater to protect them from the wind and cold. Dogs that are small, short-haired, very young, very old, sick or disabled (especially arthritic!) should definitely bundle up before heading out into a wintery wonderland. If it is also wet, consider getting a rain-slicker or water-resistant coat. Keeping warm is also important for the humans too! You should also make sure your shoes have good grips on them for those icy and slippery areas! As tough as you might think your pup's paws are, they aren't exactly immune to the cold, ice, and salt that comes with winter. If your dog will tolerate them (and this might include some training and making sure they are the right fit), the best defense is a good pair of water-resistant booties to protect them from ice, salt, chemicals, and sharp objects under the snow. If your dog won't tolerate the booties, use a paw protector salve. There are a few brands such as Musher's Secret, but Vaseline can work in a pinch as well. Make sure to rub in on the pads and areas between the toes. Whenever you come in from a walk or being outside, make sure to give those paws a good cleaning to remove any ice, snow or chemicals that your pup may have picked up or stepped in. 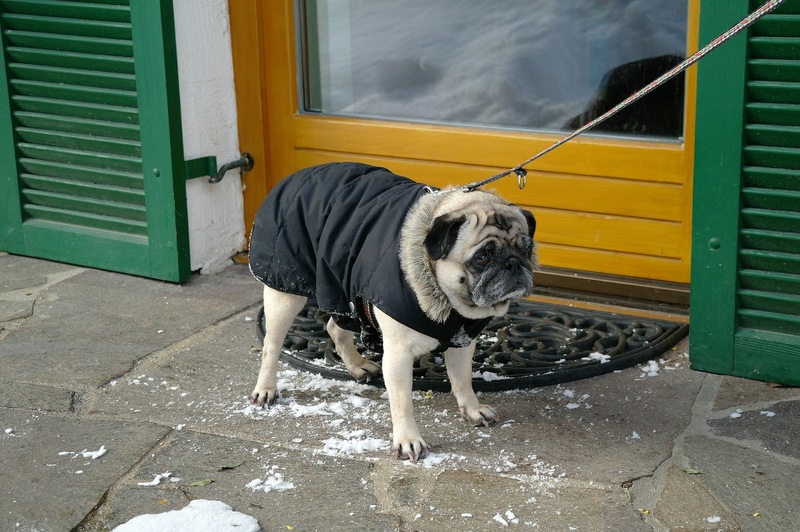 Although your dog might never leave your side, never walk in winter weather without a leash. He might want to romp and play, but the snow can make it easy to lose sight of each other and often can make it difficult for a lost dog to find his way back home. Also, low visibility makes it harder for everyone else to see you. A reflective leash or collar can help motorists see you, especially with winter making it get darker earlier. 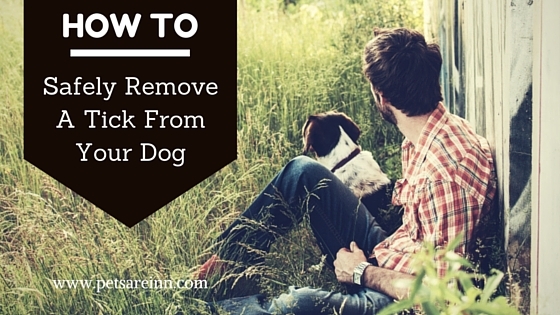 You could also use a jogger's leash or one that clips to your belt. 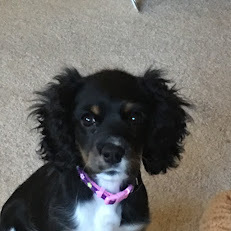 If you slip on the ice or snow, there's no chance of losing your pup. If your dog likes to pull, use a no-pull harness. This could save you from a bad fall during the slippery walks! Some dogs are very good at communicating that they are NOT happy about being outside in the cold. However not all dogs are as clear about their discomfort. Watch for shivering or shaking, hesitancy, pulling towards home. 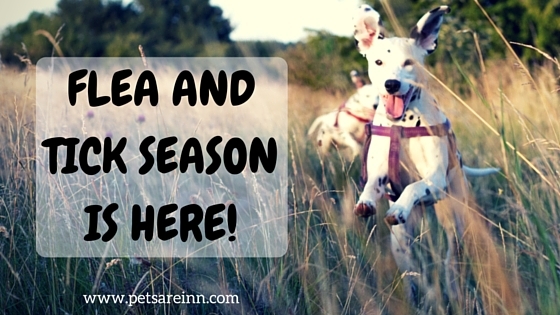 Don't force a dog that is showing these signs into going for that walk. Instead let her warm up and try indoor exercises. 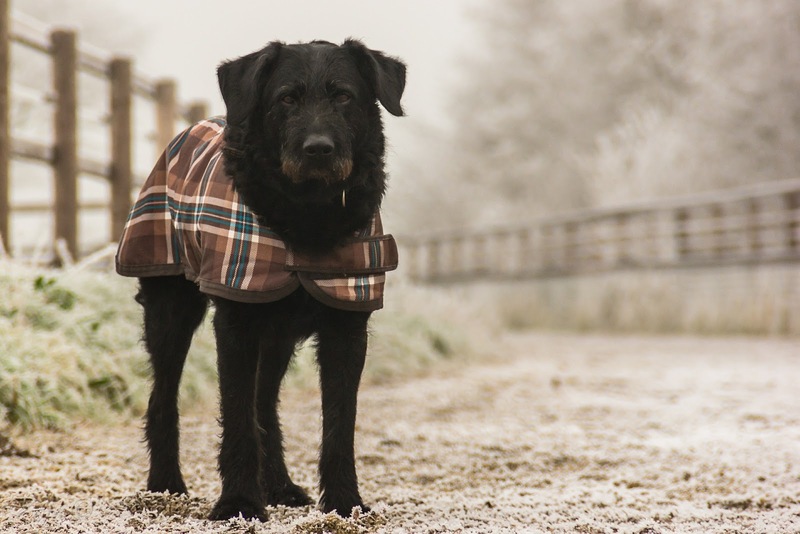 How do you protect your dog during wintery walks? Please share in a comment below!